Added on May 26, 2013 by Carolyn Van Houten. Greetings from Chicago! So, on my second day at the Chicago Tribune they sent me out of town to Charleston, Il. 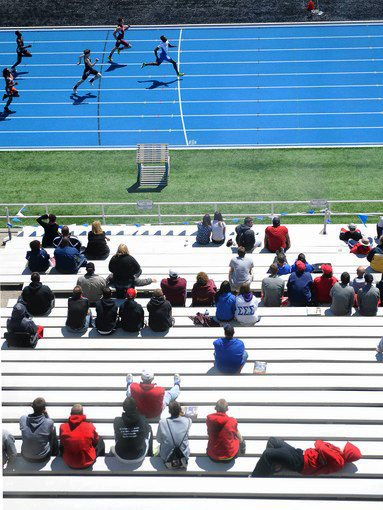 to shoot the Illinois state track and field finals. When I was in high school, I was competing on a national level with my horses, so it was great to be surrounded once again by really competitive, focused and driven teenagers working endlessly towards a goal. However, it was never about winning for me and it certainly wasn't for most of them. The support and camaraderie amongst the competitors was wonderful to see. At the end of nearly every race the winners would help the others up and encourage them rather than celebrating. I had never shot track before, so it took a minute to figure out who was going to be doing what where and at what time. The events were very spread out and occurring simultaneously, so that was a good way to force me to prioritize. At first I tried to be everywhere and get everything, but when I slowed down and hunted for moments and specific people in our coverage area, it made the whole thing a lot more manageable and the photos a lot better. The second day I tried to learn from the day before and utilize the advice I have been given lately about my compositional habits and use of moments. So, here is my first attempt at track! I would love to shoot it again. Critiques and thoughts are always welcome! PS--Some of the photos in the galleries actually are different. The articles are there too!